We live in bike country here in the Netherlands — because it’s so incredibly flat (we have virtually no mountains whatsoever!) a bike is just the ideal method of transportation. Traffic layout has been optimised for bikes, there are dedicated bike lanes everywhere and we even have special bike-lane traffic lights. With biking in mind, I thought it would be a good idea to write a little post about bike safety… Here goes! Young children can be taken on your bike but have to sit in a proper bike seat. From when the baby is about 12 months old (or when the neck and the back of the baby are strong enough), you can take your baby on the bike with you, on a special seat hanging from the steer. When your child outgrows this seat (around 2 years old), you can transfer him to a special bike seat on the back of your bike. 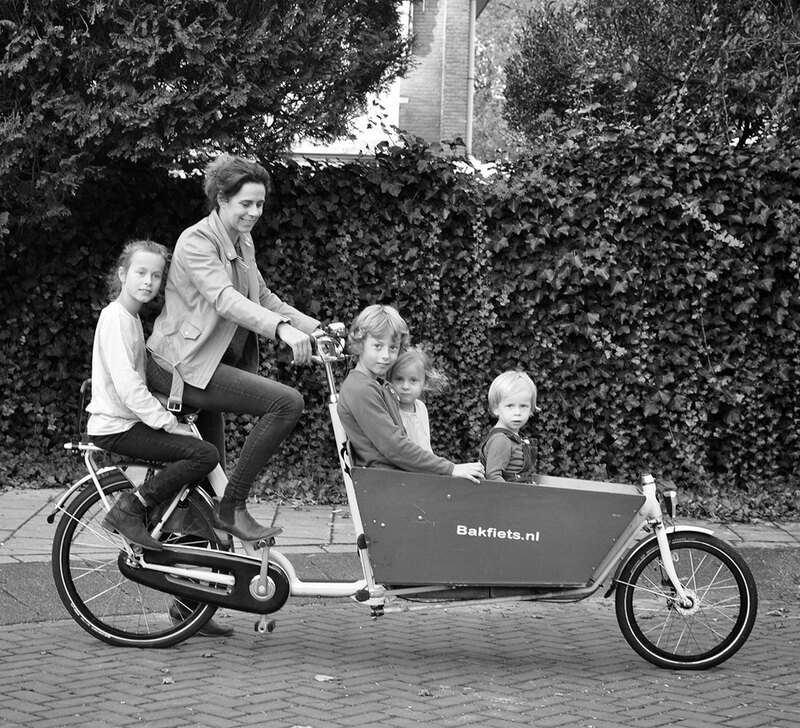 The seat on the back is more comfortable to cycle with and more comfortable for the child as well (wind, rain, sun, etc) — so as soon as you can, transferring your child to the back is a good idea. Ask you local bike store for a recommended bike seat that meets safety standards. Make sure your bike is safe, strong, and stable. Make sure that the seat is low enough so you can touch the ground with both feet when standing still. I personally like to have a special double leg bike stand under my bike so when I lift children onto my bike, the bike won’t fall over. Spike guards are mandatory when you child has outgrown the special seat on the back of your bike. It’s ok to take your child on the back of your bike when she has outgrown the toddler bike seat (around the age of 5), but do make sure that the spikes of your rear wheel are covered with plastic guards so the foot of your child can not get caught in the spikes. These kind of guards are not expensive and can be easily attached, so if you don’t have them — get them! (Both my son, Pim, and Emilie’s daughter Vivi have broken their legs because their feet got caught in the spikes, so we speak from experience here!!) Foldable foot rests that attach to the frame are needed too. Helmets should be worn. 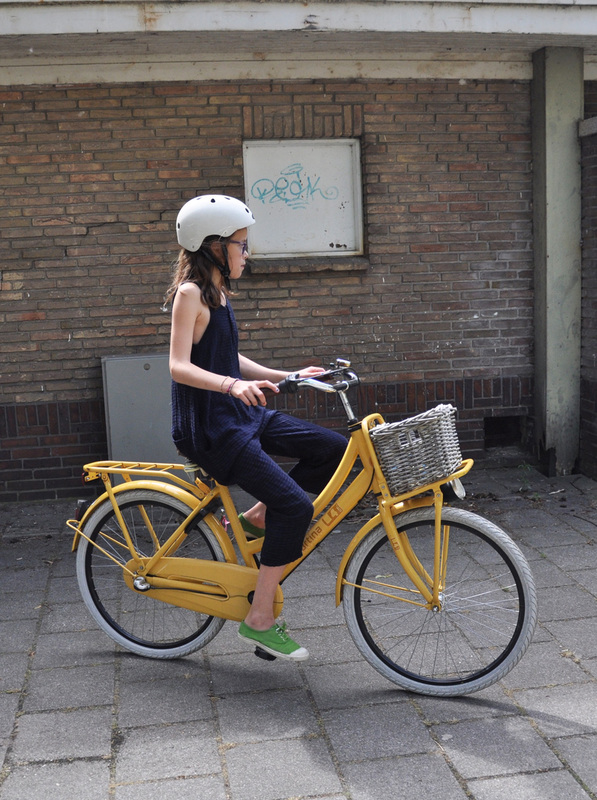 Even though here in the Netherlands it seems that nobody wears a helmet, I try to make a point of encouraging my children to wear one whenever they ride their own bike. Make sure the helmet fits well, and meets safety standards. A little side note — even though some of my friends are comfortable doing it, I would personally recommend against taking a little baby on your bike. Not even (or especially not!) in a baby-carrier. I think a baby, until their back and neck is strong enough, shouldn’t be taken on a bike altogether. Make sure you have the right size bike for your child. Your child should be able to touch the ground with both feet when standing still. A bike that is too big is not safe. I prefer bikes with coaster breaks instead of hand breaks (or both). Again, your children should wear proper helmets that fit well and meet safety standards. Practise with your children. Experience is key — children need to learn about road rules, different traffic situations and how to handle different situations. The more experienced they are, the more safe they will be. On a side note — after trying with Sara to teach her to cycle with side wheels, with Pim we learned that it’s better not to bother with these. It’s best to immediately work on balance and control over the bike (yes! running next to them!). If you can, a peddle-less balance bike like a like-a-bike is a great introduction to cycling — the child will learn balancing perfectly and the transition to a proper bike will be a piece of cake. Hope these tips will come in handy — as always, please share your tips and tricks if you have any! Always, always wear a helmet. The best way to get your child to wear one is to insist on it from day one anytime the child is on any type of bike whether it’s a tricycle or a two wheel bike. Yes, it seems silly to have them wear a helmet on a trike but it sets up a black letter rule– on wheels wear a helmet end of story. Have your child pick the helmet. There are lots of fun ones. Also, parents should be good role models and wear one. Severe head injury isn’t limited to children. I really like the bicycle models you have in Holland. Could you please tell me some brand of bikes for adults? what an interesting article! Thank you! Could you please tell me more about the Dutch baby seats? Here, we only know the kind which goes to the back of the bike and they don’t fit my bike. Could you tell me what they are called in Dutch so I can make inquiries? That would great. Thank you! We call the ‘kinderzitje’ or, specifically for the front, ‘voorzitje’. I noticed this page, probably helpful for you: http://en.hollandbikeshop.com/bicycle-seat/bicycle-seat-front/ — I always used a bobike seat. In the beginning I had a plexiglass shield but it made cycling in wind so hard so I got rid of it. Good luck! Thank you so much, Esther!!! !